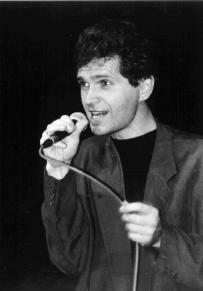 REINER KÜHL: Graduate of sound engineering (Toningenieur) at the "Fachhochschule Düsseldorf" and at the "Robert-Schumann Hochschule Düsseldorf", sang in the children's choir of the city Kaarst, the school choir, the a cappella ensemble "Das Chörchen" in Cologne, the "Kaarster Jugendchor", "Jazz by 4 und 5" (conductor and arranger), guitar lessons from Kalle Pohl, piano lessons since the age of 10, among others at the "Rheinische Musikschule der Stadt Köln". Reiner was born in Cologne / listens to all kinds of music as long as it is good/ likes to eat roast hare / is a fan of Manhattan Transfer / likes to make things out of wood / adores people who can compose good melodies / is a notorious perfectionist! "...I have always loved good music, e.g. sophisticated arrangements for vocal harmonies in jazz and pop. At a later stage I used to sing in different ensembles in order to improve my singing and to be able to realise with my own ensemble songs I like which should not be too different in quality from professional ensembles."